Rainbow Layer Cake - Kosher In The Kitch! 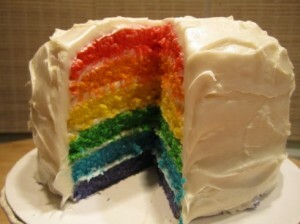 Rainbow Layer Cake - Kosher In The Kitch! I preheated the two ovens in my kitchen to 350 degrees. If you only have one oven, just heat that one up. I prepared six 9-inch-round foil pans with vegetable spray, then lined the bottom of each with parchment paper and sprayed again. In a large bowl, I whisked together the flour, baking powder and salt. In an electric mixer, I creamed together the margarine and sugar. Slowly, I added the egg whites and mixed until well combined. I added the vanilla and mixed until fully incorporated. Next, I mixed in the flour mixture and soy milk in two alternating additions, beginning with the flour and ending with the milk. Now came the really fun part! I divided the batter evenly between six medium bowls. Each bowl contained around 1 cup of batter. I used Wilton Icing Colors to dye the cakes. You can use any brand of gel food coloring, but I think the Wilton concentrated gels give a vibrant color without thinning the batter. I wore gloves while I dyed the batter so I wouldn’t get any color on my hands. I suggest you do the same, unless you want multi-colored fingers! I added 1/8 tsp. of each color to its designated bowl and whisked away. I added a bit more for the red batter, since I didn’t think the color was bright enough. Between each bowl, I washed the whisk so the colors wouldn’t combine. I transferred each color to the prepared cake pans then moved those pans in to the ovens. If you don’t have room in your oven for all six pans, you can bake them in batches. The cakes baked for only 15 minutes, so if you need to work in batches, it won’t take too long. I removed the cakes from the oven and transferred them to a wire rack. After cooling for 10 minute s, I inverted the cakes onto a wire rack; re-inverted and let cool completely. Martha Stewart suggests trimming the tops of the cakes to make them level, but I skipped this step since my cakes were fairly even. You are welcome to trim the tops using a serrated knife, if you want! I placed four strips of parchment paper around the perimeter of a 10 inch cake circle, then placed the purple layer in the center. I spread 1 cup of frosting over the first layer with a spatula so it extended just beyond the edges of the cake. I repeated the process with the blue, green, yellow and orange layers. I placed the remaining red layer on top, bottom-side up. I swept away any loose crumbs then covered the top and side with a thin layer of frosting with a spatula, also using any of the excess frosting visible between the layers. I refrigerated the cake for 30 minutes, until it set. After 30 minutes, I took the cake out of the fridge and covered it again with the remaining frosting. Wow, so gorgeous! I’ve never attempted such a fancy cake, but next time I have an occasion that calls for one, I might try this! And I love that it’s pareve! Where can I find food colorings that are gels?